Caution tape and boarded-up windows were placed at Cloverdale Town Hall to prevent anyone from entering it after a Sunday morning fire. Officials suspect arson. A sign alerts people that the State Fire Marshal’s office has declared the fire at the Cloverdale Town Hall as arson and directs who to call with further information. CLOVERDALE — An early morning fire Sunday at the Cloverdale Town Hall has been ruled as an arson by the Ohio State Fire Marshal’s office. According to Brian Bohnert, state fire marshal’s public information officer, a fire was called in at 4:19 a.m. Sunday at the town hall, 210 Mahoning St., Cloverdale. 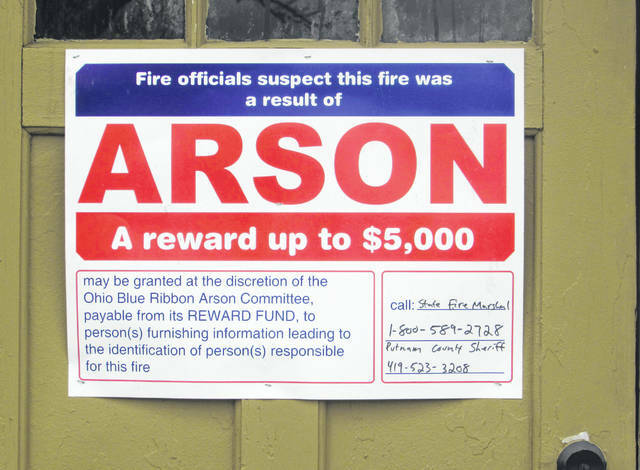 Wednesday afternoon, a sign hung on the front of the building that stated fire officials suspected the fire was a result of arson. A reward of up to $5,000 has been set. The windows on the front and sides of the building were boarded up, and yellow caution tape was hung to prevent anyone from entering the building. Anyone who has information on the fire should call the State Fire Marshal at 1-800-589-2728 or the Putnam County Sheriff’s Office at 419-523-3208. “The fire was reported by a newspaper carrier delivering to the house next door to the town hall,” Bohnert said. “When the fire departments arrived, there was smoke coming out of the windows, when they made entry to extinguish the fire,” Bohnert said. Paulding County Sheriff’s Office received the initial call before forwarding it to Putnam County Sheriff’s Office. Ottoville Fire Department was the primary responding fire department. Mutual aid was provided by Continental and Kalida fire departments, Bohnert said. The state’s fire marshal has been on scene of the fire, and the cause of the fire is still unknown. The investigation is ongoing. 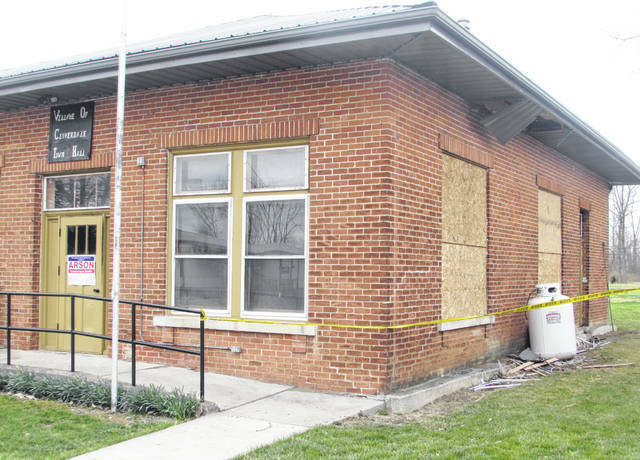 https://www.limaohio.com/wp-content/uploads/sites/54/2019/04/web1_TownHallFire1.jpgCaution tape and boarded-up windows were placed at Cloverdale Town Hall to prevent anyone from entering it after a Sunday morning fire. Officials suspect arson. https://www.limaohio.com/wp-content/uploads/sites/54/2019/04/web1_TownHallFire2.jpgA sign alerts people that the State Fire Marshal’s office has declared the fire at the Cloverdale Town Hall as arson and directs who to call with further information.